For a limited time only, coupon code ICECREAM10 gets you $10 off towards the purchase of a $50 Cold Stone Creamery gift card at amazon.com. It is ice cream season after all. The price will drop during the Checkout process, the last step before you actually place the order. If it doesn’t drop by $10, it either means you have not select the correct gift card or amount, OR the promotion expired. But they are not the only option. A number of other phones are using some of Qualcomm’s all-carrier processors, such as the Snapdragon 625. One such phone is the brand new Alcatel Idol 5S which just launched on Amazon. The product description says that CDMA support (Verizon, Sprint) is coming later this year. Which is when this new “mid-tier” phone is coming. Considering the level of phones Google has made so far, a Moto G4/G5 or Idol 5S is probably as low as Google would go in terms of performance to showcase Android at its best. If they go lower, not as show-case-y. If you have received this offer, by email or by mail, it goes like this: you earn 5% as a statement credit on purchase made with the card until 9/30/17. This includes almost all purchases, it is not a quarterly reward type. However, the maximum you can earn through this promotion is a $25 bonus, which means it phases out either at $500+ in purchase or $625+ (if they only count the 4% towards the bonus since you earn 1% anyway with the Universal card). 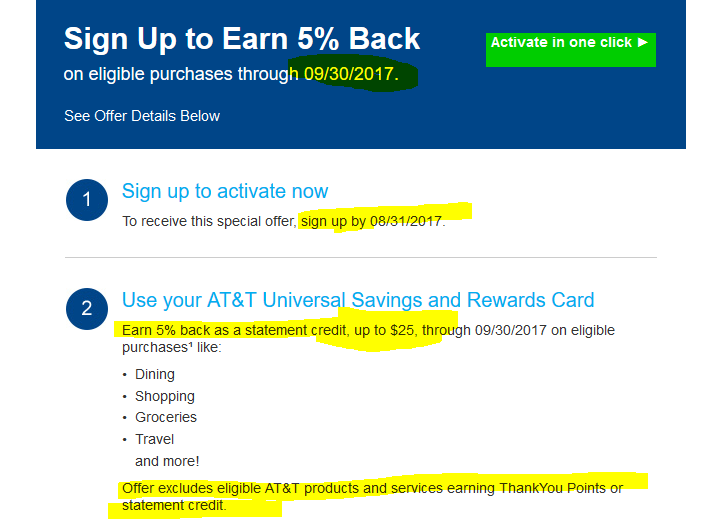 Excluded are AT&T purchases and similar offers that earn a similar or higher percentage already. If you are near a Trader Joe, your local store may have or may be getting this in! An ice cream of hippies! 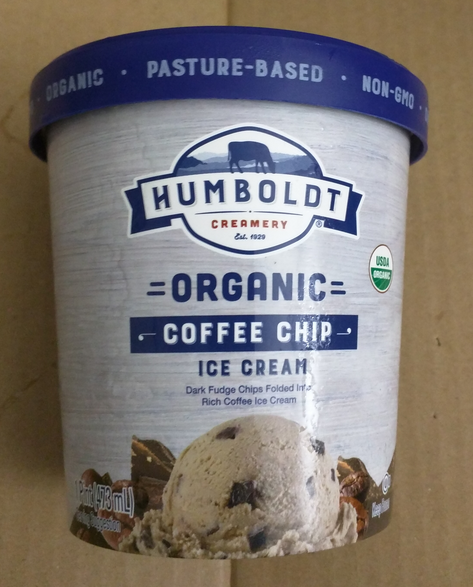 One pint of organic coffee (with chocolate chip) ice cream from Humboldt is in their freezer for $2. That’s right, yummy organic ice cream for just $2. Less than what you pay for a single scoop at most ice cream stores (and the chain stores are not organic). I just inhaled the whole pint, so I’m typing this on a sugar and coffee high 🙂 The whole pint is 800 calories (four servings of 200 calories). If you eat the whole pint, that’s 12g of protein, 48% cholesterol, just 8% sodium, but 120% saturated fats. The percentages are based on the RDA standard. Note that even though this is a very milky ice cream, it also contains some soy (soybean oil and soy lecithin). And some more furniture shopping to put your Prime membership to work. A set of two Furrino Bedroom end tables, in a dark brown color scheme, are on sale, together for $20.82 total at amazon.com and Prime eligible. Only the dark brown color scheme is currently on sale. The others are either at their regular prices or not available. The official model number for this is 2-11157DBR and all these colors, together, average 3.4 out of 5 based on over 1000 customer reviews, and have over 40 questions answered as well if you are curious about them. If you are planning a bigger Prime Pantry purchase by July 7th (2017), then you are in luck! Orders of $60 or more placed through Prime Pantry can get you a FREE Water Bottle with the PrimePantry logo on it. 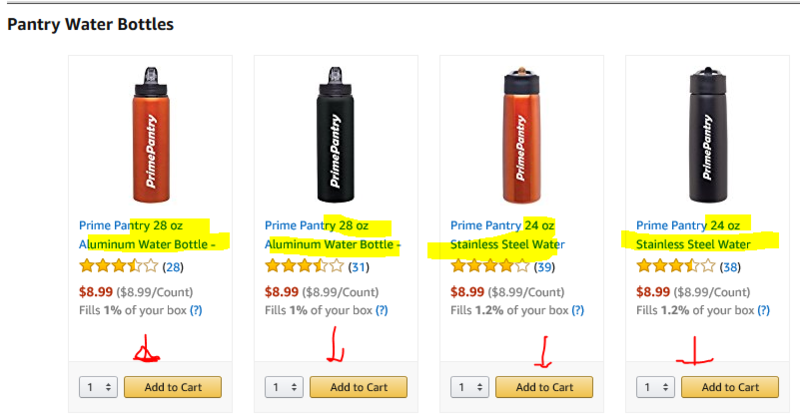 You must manually add the water bottle to your shopping cart along with the rest of your order. The above offer is stackable with the on-going Buy Five Select Items and get FREE Prime Pantry shipping. You don’t have to buy five separate items, any combination, eg five units of one eligible item, works. One more thing: don’t forget to check whether you have any remaining “Slow Shipping credits”. The shopping cart will automatically apply them anyway, but make sure you place an order before they expire. You can quickly get to your balance by going to amazon.com/norushcredits while you are logged-on to your Amazon account! Whether you are planning an outdoor trip or camping adventure, or want some extras for “indoor camping”, Amazon has a limited time promotion, they are offering the Stansport 24 Piece Enamel Camping Tableware Set for just $13.72 with free shipping for Prime members or with a $35+ order. Limit four bundles per customer during this sale. The set averages 4.3 out of 5 based on 280+ customer reviews and they have over twenty questions answered. They are only available in the blue color scheme shown at the page above. NOTE: as of the time of writing, this is restricted to PRIME members ONLY! There is no coupon, no activation, and no rewards membership required for this offer. It is running automatically at Starbucks stores, between June 27 until the close of business on July 2nd in 2017. Between the hours of 2-5pm local time, they are running a BOGO (Buy One, Get One FREE) on Iced Espresso drinks. Any combination and sizes work, but you pay for the most expensive one, so in situations like these, it’s a good idea to match the drinks to make the most of your money 🙂 Any ICED drink that includes espresso inside is eligible. You can also ask for decaf instead. This can make for an ice gift set for kids of all ages, or even as a donation at a local school or church or non-profit. It is a Book Boxed Set, all five books, the The Heroes of Olympus Paperback Boxed Set, going for $24.95 at amazon.com. Free shipping for Prime members. If you are not a Prime member, you need to add a filler item of $0.05 or more to get the $25+ books free shipping promotion. If you have a Prime membership, you don’t have to worry about the shipping fee for these. Some assembly is required obviously, but $28 is what it takes for you to get this FURINNO Low Rise TV Stand available in either Blackwood or Espresso color scheme. This is model 15044. It has a multi-tier design, giving you some flexibility on what kind of A/V gear it can hold. There’s half a dozen pictures over there at Amazon, and it averages 3.4 out of 5 based on 25 customer reviews. 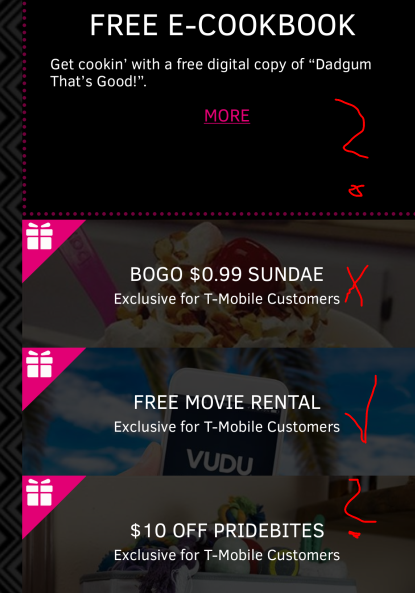 A more digital than physical theme is here for the Tuesday June 27 (2017) freebies at T-Mobile’s Tuesdays. The two actual freebies are digital, a Vudu movie rental, which in practice is a $5.50 store credit which you can use as you please (buy or rent, movies or TV shows), along with a free e-cookbook, but the ebooks offered through Tuesdays are not DRM-free, you have to use some stupid website that exists for promotional purchases. So you are stuck reading the books on the web or using that company’s apps. You can’t use your own ebook apps or your own e-readers. Needless to say, their technology is maybe 10% that of a Kindle. The two other offers are coupons. Your pet gets $10 off at Pridebites with free shipping, and you don’t even get a B1G1, but rather a sad “Buy One, Get a Second One for 99c” Sundae at Baskin Robbins ~ just like previous weeks. The weather is heating up, and so are the Bonus Stars promotions at Starbucks! A brand new just rolled out by email, and if you had been selected by their Big Computers, you have to first manually “Join the Dash” before you’ll earn the bonus points. This is yet another variation of the After 2pm (local time) Dash. 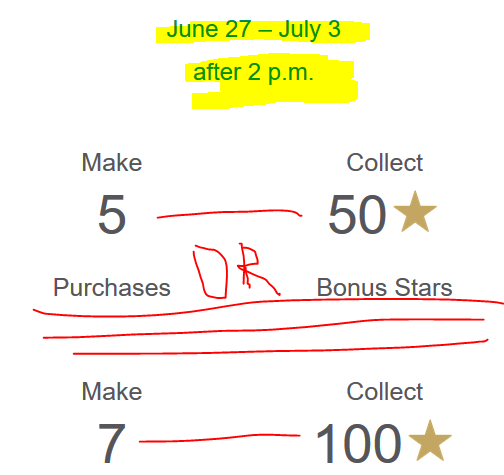 If you make five purchases after 2pm local time, between June 27 and the close of business on July 3 in 2017, you will get 50 bonus stars, in addition to the regular stars from your purchase. Or if you make seven or more, you’ll earn 100 bonus stars. 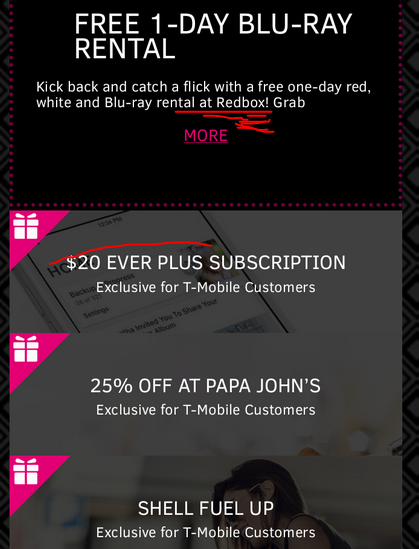 So two extra purchases double your bonus. In other words, if you reach five, you might as well go the extra mile and reach seven. Don’t forget that today (Monday June 26) is a Surprise Double Stars Day. Also, if you have a Chase Freedom credit card that participates in the 5% Quarterly 5% Rewards, you may want to hold off reloading your Starbucks account until July 1st, because the July 1 through September 30 quarter includes Restaurants and historically Starbucks had been earning 5% through Chase!